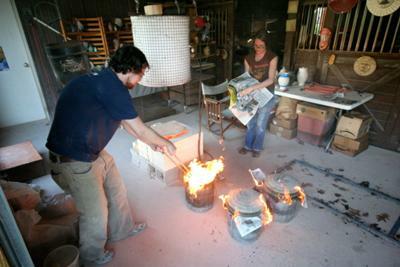 J.R. and Kristen had been making pots for years before meeting each other at the Haywood Clay Program, a professional craft school in Western North Carolina. They joined forces shortly there after, and have been together making pots ever since. Their work includes beautiful and unique pottery ranging from striking turquoise dinnerware to elegant one of a kind vases . "Pottery for us is a way of life. A lifestyle we cherish greatly. We strive to make each final piece the best it can be. Taking great care and consideration to each material, process, tool and technique that we use. We give our all into our craft and in doing so some part of us goes into the work as well." 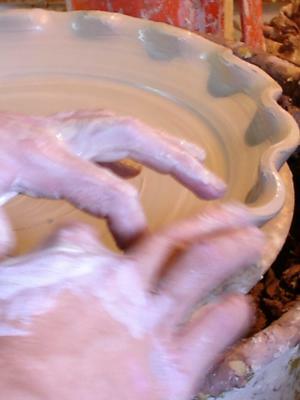 Your pottery strikes the perfect balance between function and creativity. What pleasure it adds even to the idea of eating.